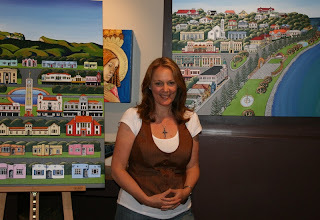 Sarah Platt's first exhibition was called "Our Town". She says that "that title pretty much sums up what my art is about. It's about our place, where we live and grow, where we come from and even where we are going. It's about who we are as a community." Proud to be a sixth generation New Zealander Platt has a keen sense of history, Sarah writes "when I finish a new print, particularly if it's of a place I've not painted before such as New Plymouth I have a great sense that I've produced something that is important. My work is a historical documentation. The more towns I cover, the more complete the documentation becomes". Platt trained as a teacher but now paints full-time. This morning we have catalogued Sarah Platt prints of Palmerston North, Wanganui, Hastings, Wellington, Havelock North, Napier, Waipawa, Waipukurau and Shannon. I need local help to identify all the buildings and features in the prints please - post a comment below and we'll add your description to the print's listing in our catalogue.